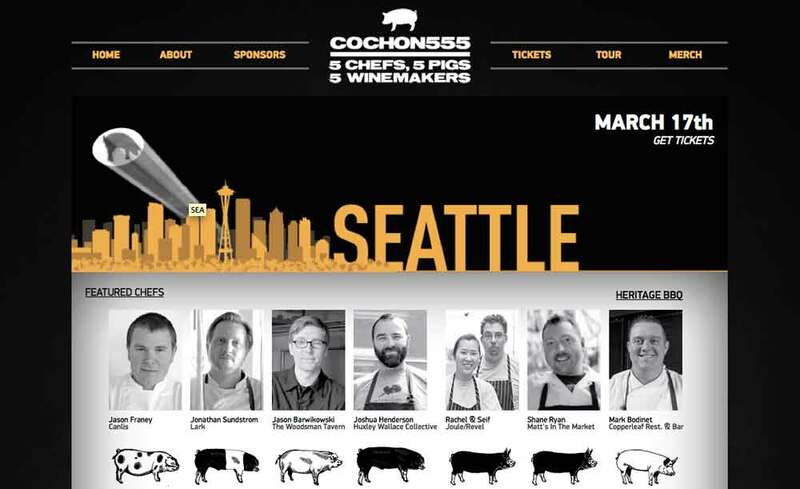 COCHON 555 – five chefs, five pigs, five winemakers, five years! Do not miss it when this one-of-a-kind traveling culinary competition and tasting event comes to town and marks a culinary milestone with its 5th Anniversary Tour. Created to promote a national conversation around the sustainable farming of heritage-breed pigs, each event challenges five local chefs to prepare a menu from the entirety of one 200 pound family-raised heritage breed of pig, nose-to-tail. Twenty judges (culinary luminaries) and 400 guests help decide the winning chef by voting on the “best bite of the day”. The winner will be crowned the Prince or Princess of Porc and will compete at Grand Cochon event at the FOOD & WINE Classic, at the recently renovated Hotel Jerome, in Aspen on Sunday, June 16. New additions to the events in 2013 include the launch of an exciting cocktail competition called “Punch Kings” featuring Breckenridge Bourbon, prepared by  local bartenders, plus the new TarTare Bar paired with SIMI Wines. VIP hour also sees a special engagement with Black River Caviar. All attendees enjoy butcher demonstrations, sustainable oysters, creative pork dishes from all the chefs, a visit to the Manhattan Bar or new Chupito Bar featuring Mezcals, plus the infamous Cheese Bar saw bold enhancements, ice-cold brew from Anchor Brewing, pork-spiked desserts and cold-brewed coffee will close out the evening.